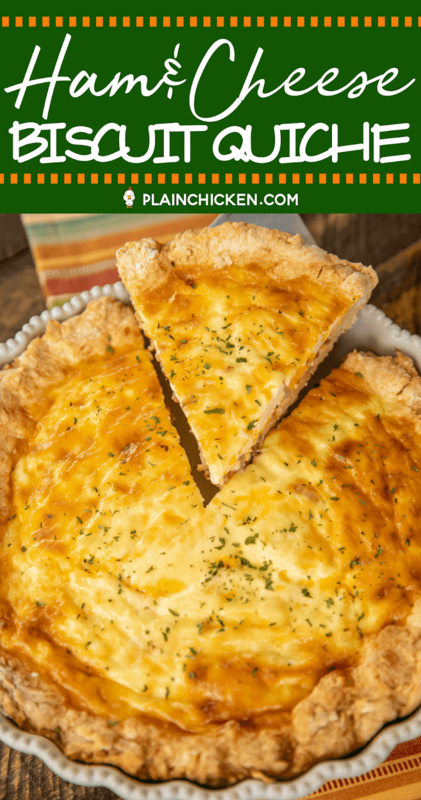 Ham and Cheese Biscuit Quiche - our FAVORITE quiche! The crust is made out of homemade biscuit dough. It is like a big open-faced ham, egg and cheese biscuit. SO good!!! 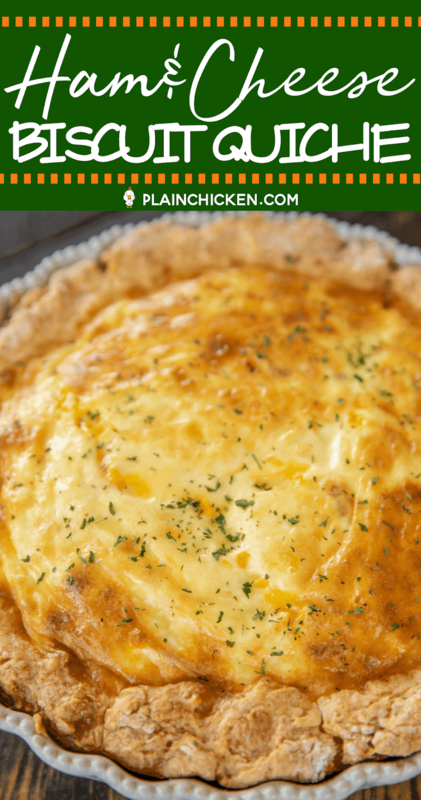 Self-Rising flour, butter, buttermilk, ham, cheese, eggs, half-and-half, and sour cream. Great for breakfast, lunch or dinner. Everyone LOVES this yummy casserole!!! Easter is coming up. If you are like me, you will probably have some leftover ham. 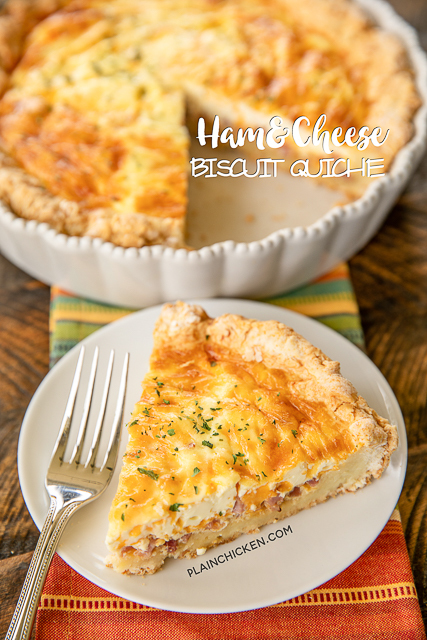 This Ham & Cheese Biscuit Quiche is perfect for leftover ham!! OMG! Homemade biscuits topped with ham, cheese, and a creamy egg mixture. Seriously the best! 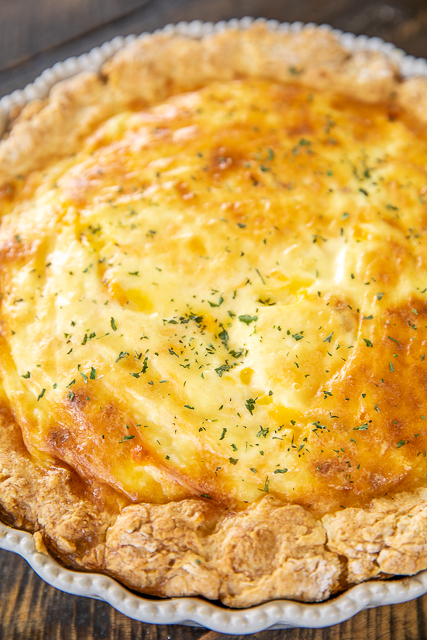 Quiche is actually very easy to make. Don't be intimidated by making the homemade biscuit crust. It is incredibly simple to make. It also tastes great! I like it 1000% more than regular pie crust! 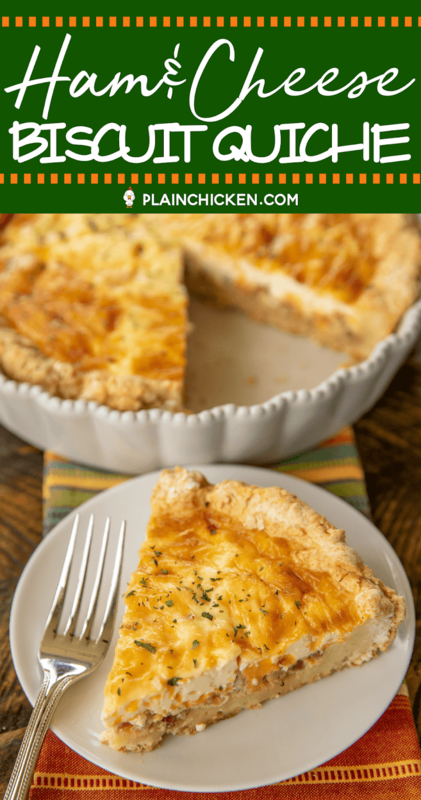 This quiche is like eating a yummy ham & cheese biscuit. 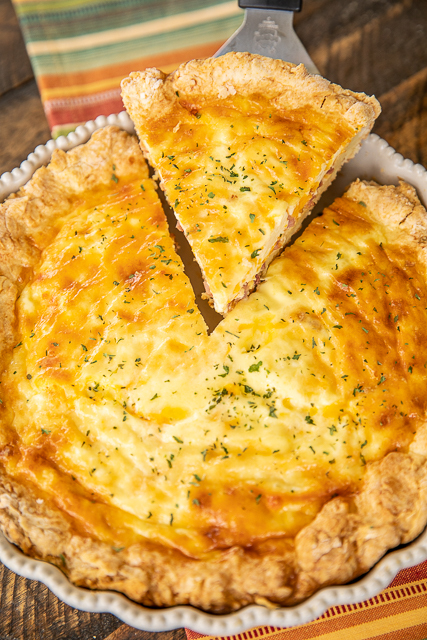 A quick tip about making this quiche. I like to sauté the ham in the skillet to remove as much moisture as possible. Sometimes ham can be really watery. It will make the quiche watery too. Cooking it in the skillet for about 5 minutes before baking will make a big difference. This also goes for any additions you might make that have high water content. Mushrooms, spinach, or tomatoes will need to be cooked first so that some of the water can cook off before being added to the quiche. There is nothing worse than a watery quiche! 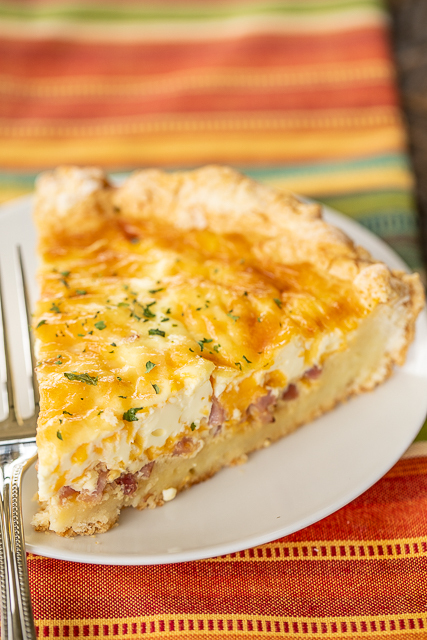 This Ham & Cheese Biscuit Quiche is made in a deep dish 10-inch quiche pan. It is kind of like a cake pan. I got my quiche pan at Target. They also sell them at Williams-Sonoma, Sur La Table, and Amazon. Can Quiche be Made Ahead of Time and Frozen? Absolutely! 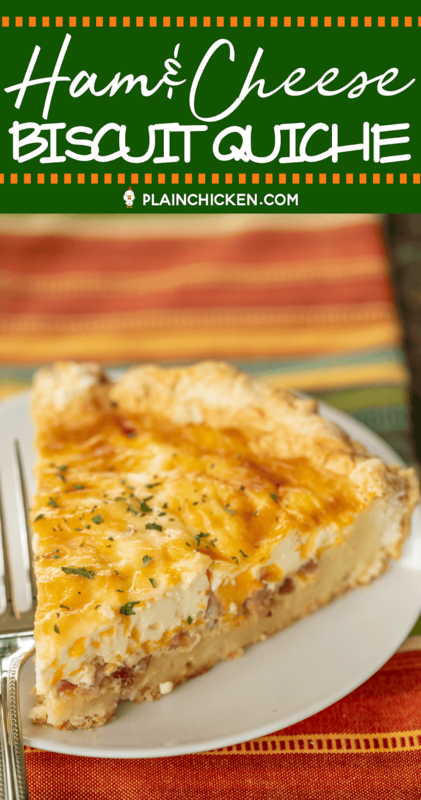 You can make this quiche in advance and freeze it for a quick meal later. I love having freezer meals ready in the freezer. When reheating this Ham & Cheese Biscuit Quiche, I suggest thawing first and reheating in the microwave. It can dry out in the oven. 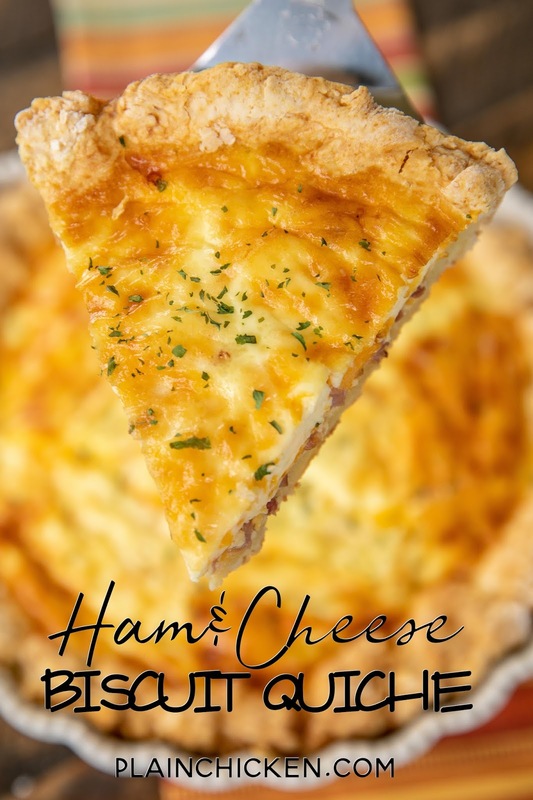 We LOVE this yummy Ham & Cheese Biscuit Quiche. It is great for breakfast, lunch or dinner. All you need is some fruit salad or pasta salad and you are set! This is already on the menu again for lunch next week. I can not wait! SO good! Preheat oven to 350F. Lightly spray a 10-inch quiche pan with cooking spray. Cut butter into the flour with a pastry cutter or two knives. Stir in buttermilk just until a dough form. Press biscuit dough into bottom & up sides of quiche pan. Press ham & cheese in the bottom of crust. Sprinkle with salt & pepper. Whisk together eggs, half-and-half, and sour cream. Pour over ham & cheese. Bake for 50 to 60 minutes, until the center is set. 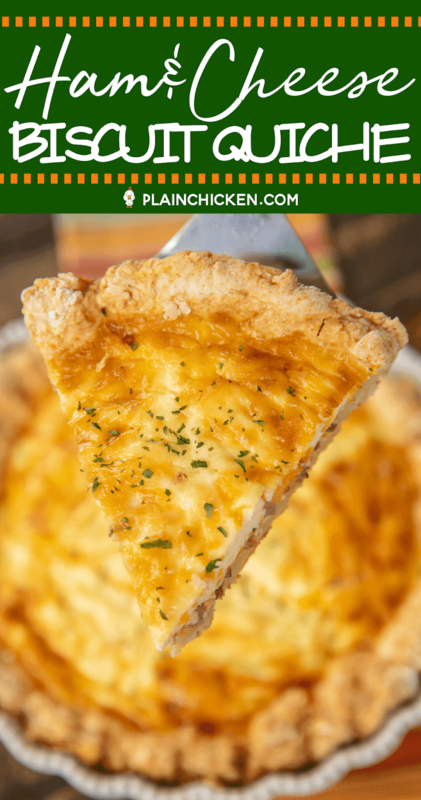 quiche is literally my favorite breakfast - i make one on the weekend and eat it all week! That would be perfect! Slice it into individual slices and freeze! Great Grab & Go breakfast! This looks fantastic! Should I use thicker ham slices or diced ham? I’ll be making this soon! I usually use diced ham, but either is just fine.